The TWSBI Classic is the company's newest offering and I was excited to pick one up when they were made available. The Classic is actually my third TWSBI pen now, but my first to make it on The Clicky Post for a review. My other models, the 540 and Mini, have been reviewed pretty heavily on other blogs, but I'd imagine they'll make their way on the site at some point in the future. If you are familiar with other TWSBI models, then you'll know what type of quality to expect from the Classic. 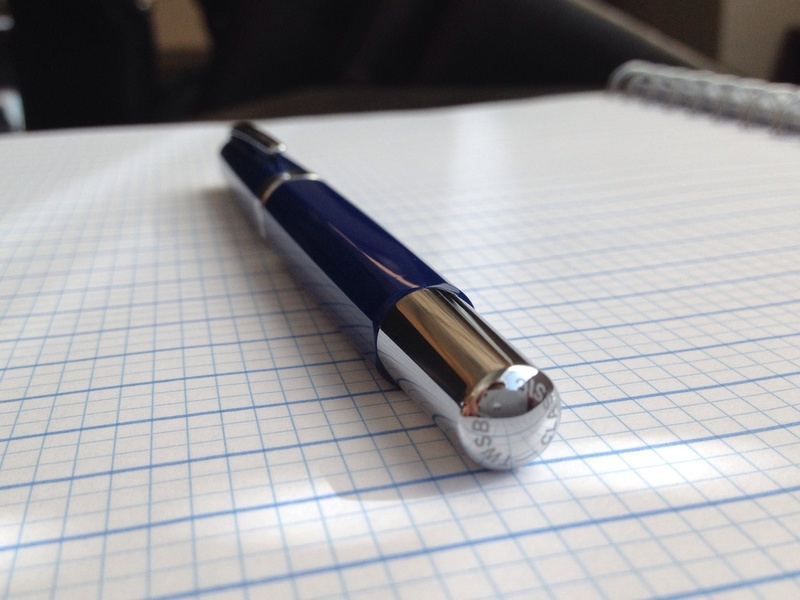 The fit and finish is excellent and is very reasonably priced like their other pens. I think I paid $60 for mine shipped and am pleased. As far as build quality, I feel that the Classic is a bit better than the others. The barrel feels a bit sturdier and the clip is very secure for a TWSBI. The clip is usually my only gripe with them as it tends to wiggle and doesn't feel solid. On the Classic, hardly any play at all which I like. I opted for the blue barrel which looks excellent. It isn't a bright blue, but is a more subtle, dark blue finish. It gives it a more refined look in my opinion than if it was a more bright blue like a Safari or Prera would have. It also comes in black or maroon. I ordered a 1.1 stub nib with mine and, although novel, I don't think I'll have a stub in heavy rotation, at least not with the TWSBI. It is fun to write with, but not really my thing for extended writing periods or for daily use. The nib writes great though. One of the big complaints about the Classic is TWSBIs decision to make the pen where the cap doesn't post. Maybe people are upset because they think they'll lose it? The Classic isn't a super long pen, but uncapped the end of the pen sits well into the fatty part of my hand. I find writing with it quite comfortable. I love the metal accents on the pen which adds some weight not found in their other models. The barrel is actually faceted and has four flat sides that transition into rounded "corners". From the promotional photos, it is difficult to see this. Maybe I just missed it completely? I like this design element. Overall, I think the Classic is a great pen for the price. If you're a TWSBI fan and can overcome the non-posting cap, I'd say you wouldn't be disappointed by picking one up. Also, so kudos to Squarespace: this entire post was written, photographed, and published from my iPhone app. I won't likely be posting like this often, but wanted to give it a go. What do you think?